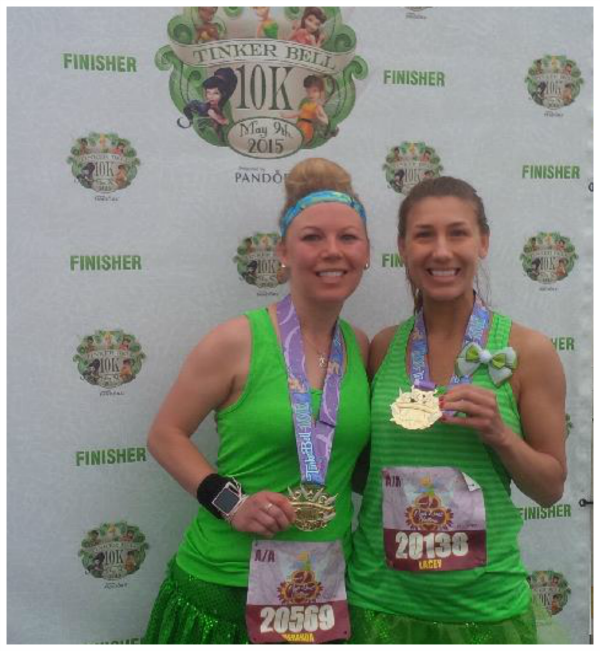 On Saturday morning we ran our second race of the weekend, the Tinkerbell 10K. 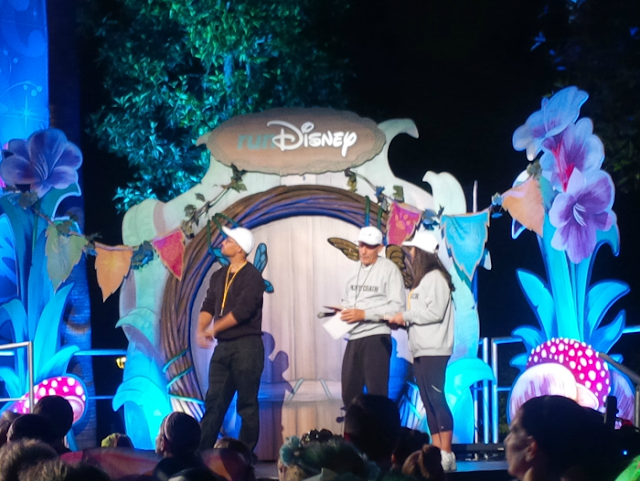 This may have been the second race, but it was the first race in the Pixie Dust Challenge. The 5K the day before did not count as part of the challenge. The weather was much nicer this day than the day before. Although I thought I was going to be wearing that coat (because I hate being chilly at the start), I decided to ditch it when we came back to the room to use the bathroom. Yea, it was closer for us to go back to the room than to use the Port o potties! 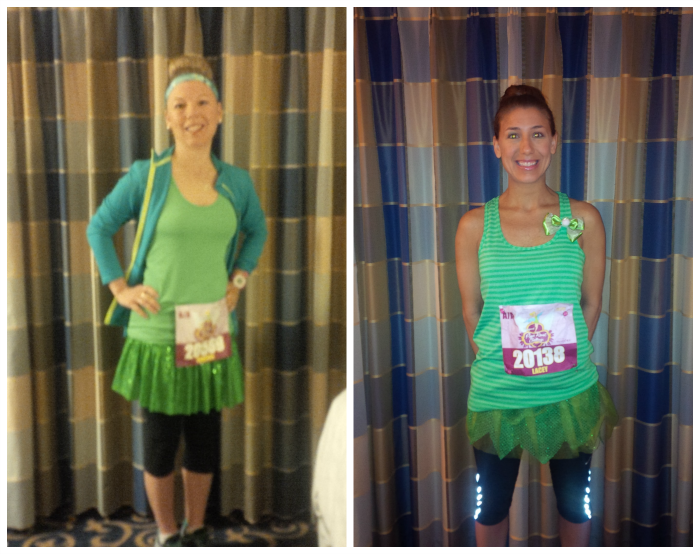 We didn't really do costumes for this race, we just wore some green "Tinkerbell" inspired attire (skirts from Rock City Skirts). As we got running I was SO glad I didn't bring the jacket. To tell ya the truth, the capris may have even been a little too much. It was a perfect day for running. One of the nicest things about running a race at Disneyland compared to Disney World is the fact that we could walk right out of our hotel and we were in the staging area for the race, then it was just a short walk to the corrals. We all started in the same corral so it was nice that we could wait around with each other. Unlike the 5k the day before, this race did not start inside the park. 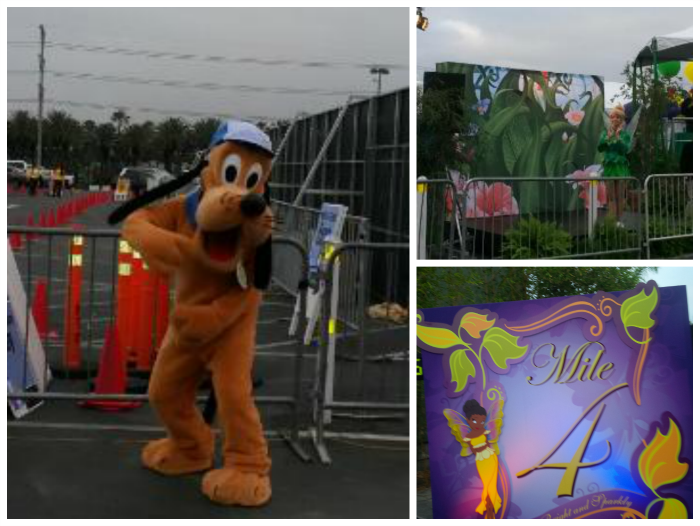 It started on Disneyland drive and we ran at least 2 miles on the highway before entering the park. From my point of view, I thought this was a very "fast race". I was planning on doing a run-walk, but everyone was coming so fast that I just decided to keep running as far as I could. I got to mile 4 before I really had to walk because the pain in my knee was so bad. So then I just decided to take it easy and take a few pictures. There weren't a lot of character stops up until this point but when I went by each of them (including the castle), there weren't any lines. I could have stopped at each of them but I didn't. At one point in the parks, there were a group of ducks that I almost tripped over. I'm glad I noticed them. It was nice being able to run through the parks, but honestly there wasn't a lot of entertainment/Characters so this race kind of went pretty fast for the both of us (sorry for lack of photos). Even though I ended up going slower the last 2.2 miles, I was still happy with my time. 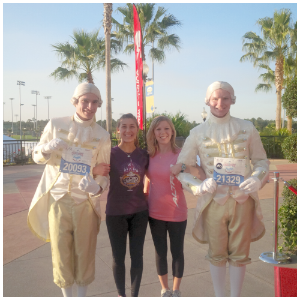 It wasn't an overall 10K PR for me, but out of the three Disney 10k's I've ran, it was a Disney PR. 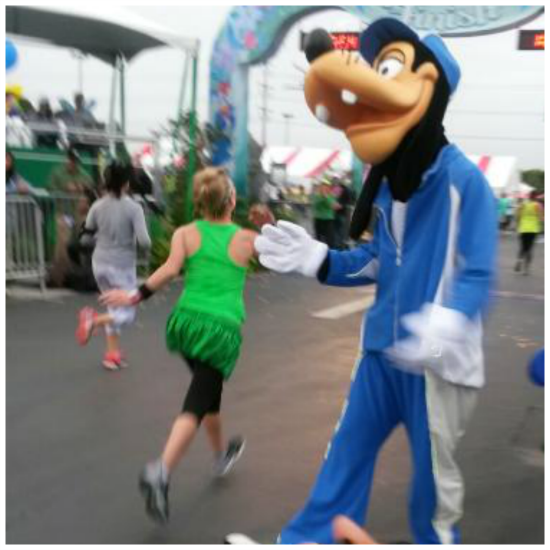 My sister was already on the sideline waiting for me as I ran through and was able to snap a quick picture of Goofy giving me a high five as I ran by. Unlike myself, my sister was feeling good the entire race. She got an overall 10K PR this day. We would later find out that Lacey placed in her age group! After the official picture, there were no additional character photos like at Disney World. We also noticed that there was no snack box given out like there was at the 5K, which was odd. I know people often complain that during the challenges like this that the snack boxes are always the same, but at least we get them. This race there was nothing but a banana which we thought was odd. We actually like the boxes! We spent the rest of the day playing at California Adventure. I couldn't think of a better way to celebrate completing a race and Lacey's new PR! Have you ever placed in a race before? 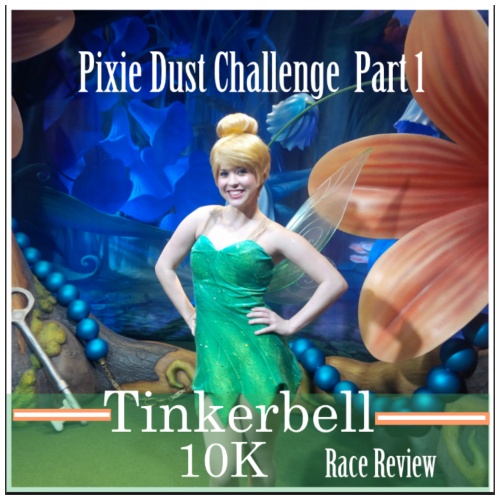 If you'd like to read about the second part of the Pixie Dust Challenge, The Tinkerbell Half Marathon, click HERE. Loved seeing you ladies before the race started and congrats to Lacey on the PR and AG award. Your photos in CA adventure are really cute all matching in your jackets! I'm excited to get my AG awards from this race too....hope they are as nice as the one I just got for the Princess Half! I love your tinkerbell outfits. So, so cute! It's great that the two of you get to race together so often. That makes races even more special. Congrats to both of you! Such cute outfits! Congrats to you both! I've never run a Disney Race. Looks like so much fun!! I've also never come close to placing in my age group for anything other than coffee consumption. So Kudos to your sister and to you for a great run! Boo Disney for only a Banana! I think for the cost of the race, they could do a little better. So double Boo! Y'all are the cutest Tinkerbells! I can't imagine placing in a Disney race with all the people - that's awesome! Congrats to Lacey on both the PR and AG award! What a fun place to earn both at! Your hair looks great! It sounds so nice that the hotel room was so close to the start line that you could just go back as needed. And congrats to Lacey for placing in her age group and the PR. On one of the podcasts I listen to, they said the rumor about the missing snack boxes was that they found out at the last minute that one of the components (yogurt or apple sauce maybe?) was past the expiration date. Those ducks must live a pretty good life! I've seen them a few times and they're always surrounded by a group of people oohing and aahing at them. I'm sure they get fed all kinds of popcorn too. I hope they had the sense to get out of the way of the runners, though! You girls look so cute in the green, even though not costumes, you both look put together so cute! Congrats Lacey on the AG placement :) I am sorry the leg pain returned for you Meranda. I thought it was really strange that all they gave out were bananas too! It seemed a bit chincy for an expensive 10K. Sorry your knee started to bug you on the race, but well done! And congratulations to Lacey on her 10K PR! Great recap! Congrats to Lacey on her 10k PR. 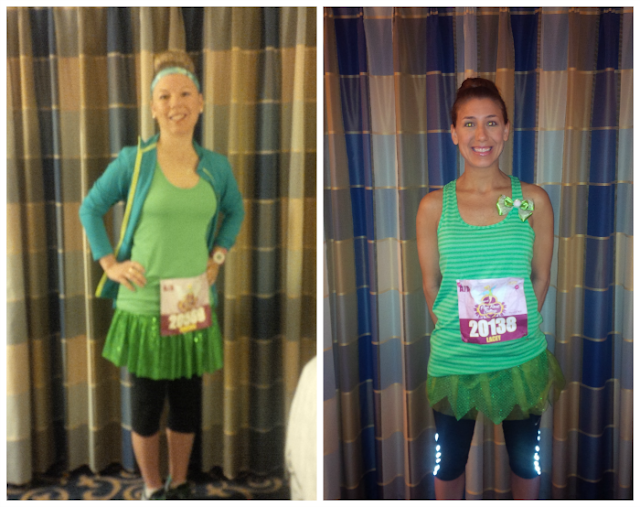 We were at the Tink half and had a blast! Sounds like a great day to race! Congratulations also to Lacey on placing in such a large race thats kind of like double the accomplishment with large crowd runners like that. That is strange about only a banana at the finish very odd, wonder if the rest of what they had didn't show up in time or something. But very cool to just walk to the start from the hotel room. I like races like that:) Great job ladies! Placed in age group in DISNEY? that's pretty awesome!!!! You all look so dang cute - as always!!!! You'd think Disney would have something more then bananas!! Something must have gone wrong somewhere - that's just weird. You look so cute! That's a bummer about the snack boxes though, I always look forward to them too. so cute and congrats to Lacey on the AG award! i definitely think the snack box was because of the expired applesauce. I think they should have just told us and we could have thrown it out. it put a kink in my post 10k food plan especially because I was trying to get to DL ASAP to ride haunted mansion. Sounds like another fun Disney race! Weird that they didn't have snack boxes after though. Such a great recap and I am thrilled to have found your blog! I ran teh races as well so we ran together wohoo! I was also bummed about there being no snack box a perk I enjoed at the DIsneyland 10K event last year. Teh Tin was my first challenge and my first 1/2 I am really enjoying run disney. 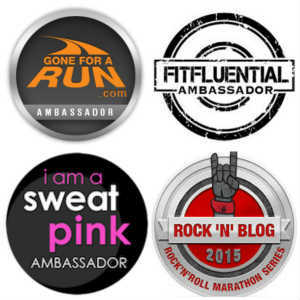 I am doing teh Anvengers run in Nov and hope to participate in the Princess run in feb. Are you ladies signed up for any other run Disney events soon? Thanks again for stopping by my blog! You guys are all so cute! Congrats to both of you for your individual PRs! Sounds like a great race! Congrats to Lacey on her PR/AG award and for your Disney PR! What a great picture of the three of you at the end of the post. You two are always so cute! Weird that they did not have a sanck box after a 10K but they did for the 5K? I would have been hungry after that run! Looks like you two are having a blast! Awards. Glory. lol Cogratualtions you two and an awesome recap.